The Copper River winds between the rugged Chugach Mountains and meets the Gulf of Alaska just east of the coastal community of Cordova. Along with the town's remote location, the prized Sockeye and King Salmon that return each year drive the town's economy and give Cordova a unique Alaskan flavor. The Copper River runs 287 miles through Southcentral Alaska from the headwaters in the Alaska Range to the tidal mudflats bordering the Gulf of Alaska. Linked to five other glacial rivers and their wetlands on the perimeters of the Copper River, the Delta forms the largest continuous wetland on the North Pacific coast. Tidal flats and sloughs, saltwater marshes, estuaries, freshwater ponds, and waterlogged muskeg (peat soils) of the Copper River Delta compose this vast interwoven wetland of 700,000 acres. The Copper River Delta provides abundant vegetation and endless mud flats for shorebirds and other animals to feast. Five to seven million shorebirds visit the Copper River Delta every spring. The Delta has 36 species of shorebirds, primarily Western Sandpipers and Dunlins. South of the marshes of the Delta, the tidal mud flats present migrating birds with tasty, energy-rich morsels like pink Macoma clams and marine worms. Some shorebirds remain on the Delta to breed, but most head further north to other Alaskan wetlands. The Copper River Delta is a major stopover site in the western hemisphere, making this wetland a vital link in the chain of wetlands. In the summer months, "The Copper" carries a million metric tons of sediment each day and dumps it along its meandering journey to the sea. The Copper adds more sediment to the Pacific Ocean than any other source. Six glacial rivers contribute to the Copper River's enormous load, which has formed over thousands of years the 600-foot deep mud flats at its mouth. These mud flats offer shorebirds a feast of mollusks and other invertebrates living beneath the surface. The Cordova Ranger District of the U.S. Forest Service manages this magnificent wetland habitat primarily for fish and wildlife. The savored salmon runs of the Copper River depend on the cold, silty waters as a highway to the streams where they hatched and will lay the eggs of the next generation. 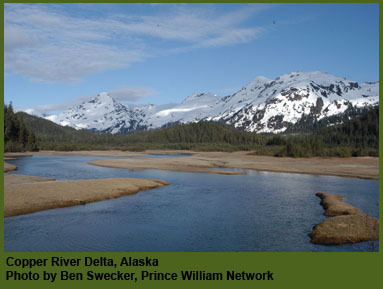 In addition, brown bear, black bear, moose, wolves, coyotes, mountain goat, sheep, Stellar sea lions, trumpeter swans, and three species of amphibians make the Copper River Delta their home.